300 Weatherby ammunition is a very powerful round, utilizing a 30 caliber bullet. The 300 Weatherby Magnum uses the plentiful and popular 300 H&H Magnum case as its parent case. Roy Weatherby, the famed gun and ammo designer, designed the round in 1944. 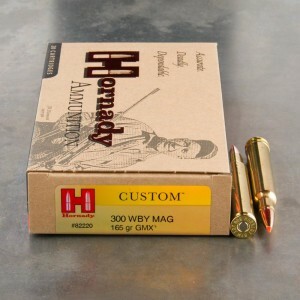 The 300 Weatherby Mag is Weatherby’s most popular round by far. Despite nearly a century of history, the round is still one of the more powerful 30-cal cartridges available to American civilian shooters. Because of that power, the 300 Weatherby Magnum is one of the more popular rounds with big game hunters, which has led to increased availability around the world. 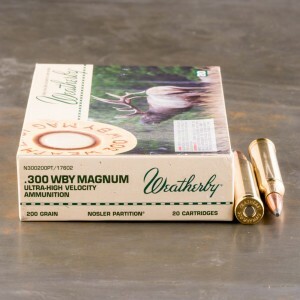 300 Weatherby Magnum ammunition comes in a wide variety of loads, from lighter, more moderate rounds, to heavier, more powerful rounds. The lighter loads are typically a 150 grain round fired at 3,540 feet per second, and heavier loads are typically 220 grains at 2,845 feet per second. Excellent accuracy, but does not expand on deer. Although I've got no expansion, every deer shot has dropped instantly.